By ordering from Access Display Group, Inc., you are joining hundreds of government entities including: federal agencies, state offices, city branches, county offices, and military bases that purchase their display products from us. We have been serving state, local, and federal government agencies since 1992. To see a partial list of federal, state and local government customers click here. While our GSA application is under review, we do offer special pricing for Government and Military Agencies. These special prices will vary according the display product ordered and can be determined by calling customer service at 800-289-1539. 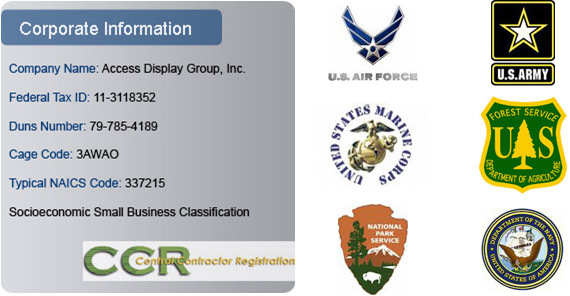 Access Display Group, Inc. is a CCR Registered supplier of the United States Government. We accept U.S. Government and accredited institutions Credit Cards, Purchase Orders and contract orders through the Defense Logistics CCR. Our standard terms are NET 30. Besides common methods of shipping orders via UPS, FedEx & Freight Carrier, we also can ship orders to military APO/FPO addresses via USPS as well as provide alternate freight options. Over the past 15 years numerous government agencies buyers and military facilities purchasing agents have ordered direct from our manufacturing division, SwingFrame or through its many re-sellers and dealers. Many of the display products we offer can be shipped throughout the states and APO addresses. Wall and floor displays including poster displays and cases, sign holders and stands, metal and wood display cases, meet numerous applications. The diverse list of displays offered include SwingFrames poster frames, sign holders, sign stands, poster stands, elevator frames, display frames, enclosed bulletin boards, lockable enclosed cork boards, shadow boxes, newspaper frames, enclosed letter boards, directory displays, wall display cases, menu frames, outdoor poster cases, illuminated displays: backlit light boxes, edgelit light boxes, LED displays and numerous other fixtures.